"Black Mirror," a British series about techno-paranoia, has drawn a cult following and is a hit on Netflix. Is an American remake of "Black Mirror," the British anthology series that's a big hit on Netflix, in the cards? Yes, but for now, details are scarce. At an industry conference on Wednesday, Charlie Corwin, one of the executives involved with the show, included "Black Mirror" on a list of television formats from other countries that are ripe for American remakes and redevelopment. I was interviewing Corwin, the co-CEO of Endemol Shine North America, on stage at the conference. I followed up by asking about the plans for "Black Mirror." "I can't say," Corwin responded. But when I told him I would love an American adaptation, he said, "We would love that too." I came away thinking that something is in the works, but that the company can't say anything about it for the time being. The possibility is certainly enticing. "Black Mirror" has been a cult favorite in Britain ever since it debuted in December 2011. Only seven episodes have been produced -- two sets of three episodes each, and one Christmas special. Each episode stands alone, with different characters and plots, but they're tied together by an overarching theme of techno-paranoia. One episode imagines how the ability to record and rewatch all of life's memories would ruin relationships. The British series was written by Charlie Brooker and executive produced by Annabel Jones. It was produced by Zeppotron, a production company that is a part of the sprawling Shine Endemol Group. The newly merged Endemol Shine Group specializes in exporting television formats all around the world. Many of the formats are reality shows -- think "American Idol" or "The Biggest Loser" -- but the company has started to prioritize scripted TV like "Black Mirror," too. One of the company's British hits, "Broadchurch," was recently adapted for the United States and renamed "Gracepoint." It debuted last year to high expectations, but was not renewed by Fox due to low ratings. Many of the other company's exports have been more successful, however. 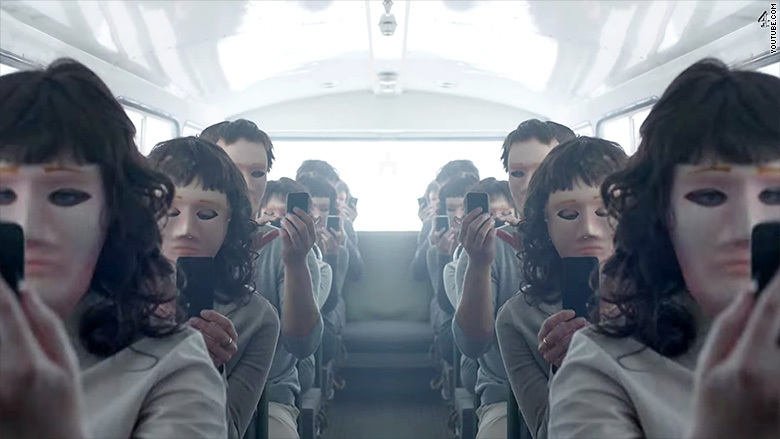 The British "Black Mirror" arrived in the U.S. in December, via Netflix (NFLX), and received a huge amount of press attention, particularly from technology-focused publications. Gizmodo called it "the best show about technology." Variety reported last month that American cable channels "were initially hesitant about the series" when Endemol tried to sell the existing episodes. The satellite broadcaster DirecTV (DTV) ended up buying the rights; Netflix came along later. But there's a lot of interest now. Several television networks have inquired about an American adaptation of the show -- but it is unclear if any talks are taking place. Corwin was tight-lipped on Wednesday. But during our on-stage interview, he went out of his way to praise Brooker and Jones for what they've created. They "have touched on something that hasn't been seen since a show like 'The Twilight Zone,'" he said.